Success does not happen by accident nor does it simply fall out the sky into one’s lap. Success is based on effort, work, and honestly, being prepared when opportunity presents itself. Any successful person will tell you it took years of trying, overcoming one failure after another, and continuing despite the odds or doubters. Success is the byproduct of resiliency. Success is not something you can buy at a store, inherit, or just wake up. If you want it, you have to go get it! It begins with a mindset of “I refuse to quit or give up;” “I will not stop to achieve my goals;” “No matter what, I will not let it deter me from my destination.” As cliché as it may sound, how you think, what you think, will ultimately dictate your outcome. 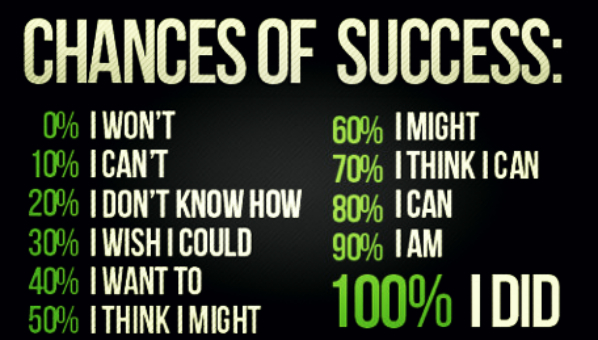 Can’t and won’t are not words of success, but will manifest if allowed. What you sow is what you shall reap and sowing means planting good seed in fertile grounds and then tending to your crop. Success is not a part time or seasonal job, but a calculated journey. The next time you think it may be too much or feel you are not qualified, you are right! If you feel you are undeserving, cannot live up to it, the challenge is too great, you are right! But if you believe against all doubt, fight for your dreams, pursue with an unbridled passion, and put in maximum effort, success can and will be yours. Previous What Did She Say? Love it!!! !, “A chance taken is an opportunity not missed.”……simple and to the point. Charmonike, thank you so much for following BrotherWord. More so than being correct, I hope it has been inspiring. The greatest breakthroughs in life came because someone took a risk. When no one else believed, supported, or encouraged, it was the risk takers who took a leap of faith that ultimately changed the world! Risks are scary, unpredictable, and the cost could be detrimental, but the reward is so much greater. What we gain from taking risks is invaluable and far greater than one can imagine. We gain confidence, our dreams grow bigger because we are no longer afraid to reach further, we become stronger in our convictions, we waver less because we realize that inner strength is greater than non-believers, and we learn to throw caution to the wind and pursue our heart’s desire. What we gain from risk is a newfound sense of self that is immeasurable. Please keep taking risks and please let BrotherWord know what new plateaus you conquer. Thank you for this timely motivation! Success is very much predictable and so is failure. I love your statement..”Success in life is not based on need but on seed.” Planting seeds now prepares and equips you to be ready when an opportunity presents itself. Be Ready so you don’t have to get Ready! It is easier said than done, espeically if you dont know where to start to prepare for something that you can not see or is currently not within your reach. I guess that is the beauty of it all….starting somewhere regardless of what it looks like or seems like…..Do it first and feel it later. Every successful person started somewhere and that somewhere is at the beginning. As they continued to work towards their end goal, they made more and more progress. You are so right that it began with a mindset that they Can and Will. WOW! We all have what we need in us to start what we can. We often look at others who are successful and not realize the years of hard work, mistakes, fails, sleepless nights just like you said. Truth be told many of us and even myself, desire the end result but do not want to put in the work. There is beauty in the work, the process and the journey. MB, thank you for taking time to engage in the conversation and for also following BrotherWord. You are absolutely right! Success starts with a mindset followed by a determination coupled with an unflappable desire to overcome no matter what and a willingness to fail at times and never quit. Success is the byproduct of hard work; it is not an exception. People do not fail because they tried, they fail because they are not willing to follow through to the end. I am very glad these words have made an impact and hopefully have lit a fire within you to achieve your goals and pursue them with everything in you. Success is yours if you really want it and are not afraid to go after it! Make it happen. The price you pay now will have no comparison to the riches you will gain. Remember, what you reap is what you sow. What seed will you plant today? Come back soon and thank you again for supporting BrotherWord.